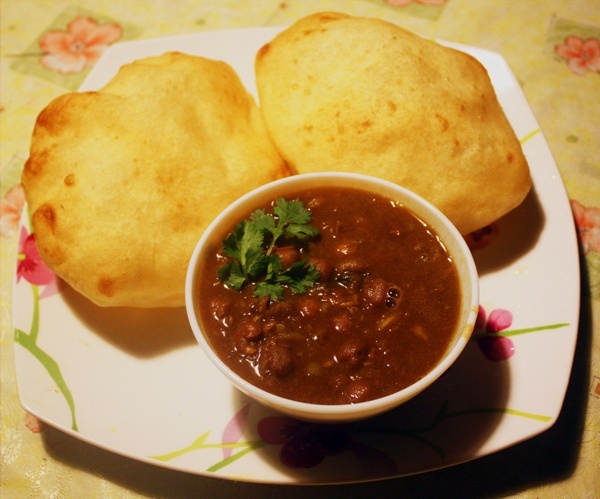 Bhaturas are fried Indian bread which is best served with Spicy Chick Pea Curry (Chole) ! Mix the flour, baking powder and salt together. Then add the oil and sugar to the flour mix. Add the yogurt and knead the dough. If required, add some luke warm water while making the dough. The dough should be soft and pilable. Make the dough into medium size balls. Lightly flour a clean, dry rolling surface and place one ball on it. Roll out into a circular shape of 6″ diameter. You could also roll the ball into a long oval shape of the same size. After the oil becomes hot, add a rolled-out Bhatura to it gently, to avoid splashing hot oil. In 5-7 seconds, turn gently with a slotted spoon. Wait another 5-7 seconds and press gently in the center of the Bhatura with the slotted spoon. Drain and remove from oil when done and keep in bowl/ plate on paper towels. This entry was posted in Breads/Cakes/Rotis/Parathas by Kamakshi. Bookmark the permalink.